You may know Len Elmore from calling college hoops, but he does so much more off the court. You’ll be seeing Len Elmore in his customary role as a CBS analyst for March Madness, calling games in San Jose on Friday and Sunday alongside Spero Dedes, Steve Smith, and Ros Gold-Onwude. Elmore’s called basketball games for 32 years, including the incredible 1992 Duke-Kentucky game where Christian Laettner hit the most famous shot in college basketball history. But what you probably don’t know is what Elmore does off the court. On a sunny and cheerful Monday morning right after selection Sunday, Elmore sat in a small shared office inside Columbia University’s Lewisohn Hall, where he began working in August as a Senior Lecturer in Discipline in the university’s Sports Management Program, part of the School of Professional Studies. Wearing a plaid shirt, jeans, and sporting a salt and pepper goatee, Elmore was especially relaxed because the students are on spring break for the week. When school is in session, Elmore’s classes, one per semester, include Athlete Activism and Social Justice In Sports and Leadership Management. The former class is a course Elmore conceptualized and designed, and was the main reason he wanted to teach at the school. Elmore wanted to impart to his students the context and the history behind athlete activism, which he thought he did successfully during the fall semester. From the post Civil War era to Jack Johnson and Paul Robson early in the 20th Century, to Jackie Robinson, Tommie Smith and John Carlos, and Muhammad Ali, the fall class was open to the entire student body, not just athletes. A couple of graduate coaches took the course, including one former athlete. “I think it was relevant because these kinds of ideas and concepts and understanding of history helps managers going forward make better decisions on how to handle things,” Elmore said. If the students understand the context and the history, Elmore thought, they can make more informed and reasoned choices when in positions of power later in life. Elmore was never an ordinary basketball jock. After finishing a 10-year pro career in the ABA and NBA in 1984, Elmore attended Harvard Law School. In 1985 during his 2L year, Elmore got a call out of the blue from Raycom, where he started his broadcast career. Last weekend, Elmore was in Charlotte for the ACC tournament and a reunion in conjunction’s with Raycom’s final weekend as a television outlet. Elmore got his J.D. from Harvard in 1987 and went to work as an assistant district attorney in Brooklyn while he called college hoops on weekends. Over the years, Elmore has had his fair share of side gigs and jobs, including a five-year stint as an NBA agent, a role as president of the National Basketball Retired Players’ Association and a 10-year tenure on the board of trustees at his alma mater, the University of Maryland. He currently serves on the board of directors of 1-800-Flowers and Lee Enterprises, a newspaper conglomerate. Elmore has always been heavily invested in collegiate athletics. He served on the board of director, and was later named CEO, of iHoops, an ill-fated joint venture between the NCAA and NBA that looked to clean up college and youth basketball. That mission was difficult to execute because there were people in the NBA only focused on getting their hands on the top 50 high school players each year, according to Elmore. “This was a not-for-profit mission, but given a for-profit purpose,” Elmore said. As evidenced on the pay-to-play scandals impacting college hoops teams, coaches and players over the last couple of years, there are plenty of issues Elmore believes needs huge improvements on in the game. Elmore disagrees with the ever-popular notion that collegiate athletes should be paid and that would solve all these scandals, though he makes an exception for players’ image rights. Though Elmore is unsure how long he’ll get to call the tournament for, he’s thankful that he still gets that opportunity, one he calls a labor of love. Even though Elmore turns 67 next week, he still calls games for Fox and CBS during the regular season. He always makes sure to set aside time to prepare for his games, and works with a stats company to ensure he’s provided with the data he wants so he can be ready for the teams he’s calling despite his busy schedule. In addition Elmore’s teaching duties at Columbia, he’s also supervising a group of CU students who were asked by the NFL to evaluate their social justice initiatives and compare it to other leagues. “We’ll see what the outcome is,” Elmore said. From growing up in the New York City projects to today, Elmore has always been extremely dedicated to education and academia, in the process empowering students to realize they have an important voice in the world. Elmore said that the life he’s led, from the NBA and Harvard Law to various jobs, firms, boards and commissions makes him uniquely suited for his role as an educator, one he thoroughly enjoys. 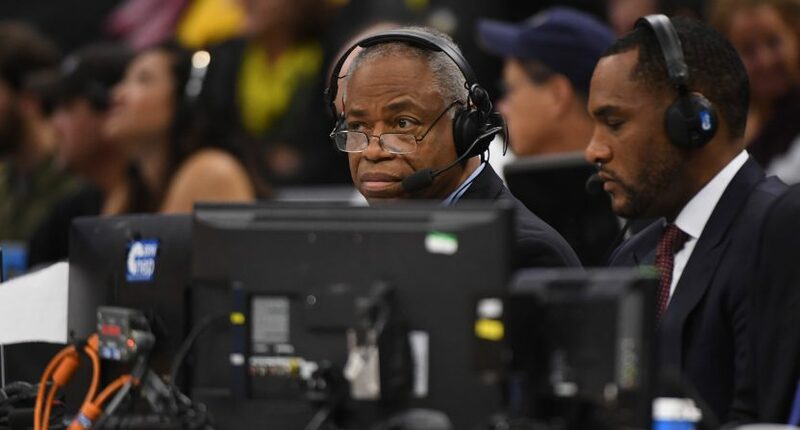 You’ll most likely only see Len Elmore on TV analyzing college basketball, something he’ll always love to do. But at this stage in his life, Elmore’s true calling really is fulfilled in the classroom.